1.75 fl. oz. 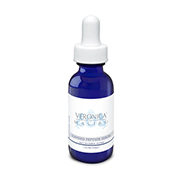 (50 mL) – Apha Lipoic is an antioxidant that helps in the cell turnover process. It works to reduce the effects of free radical damage in the skin. Alpha Lipoic minimizes large pores, resurfaces skin texture, improves elasticity and provides superior antioxidant protection. DMAE acts as an antioxidant cell membrane stabilizer. It helps to firm and brighten the skin, keeping your skin looking healthy and diminish the appearance of wrinkles and sagging. Apply in the morning and evening to the face and neck with light pressing motions. Apply Seaweed Peptides Serum beforehand if needed.